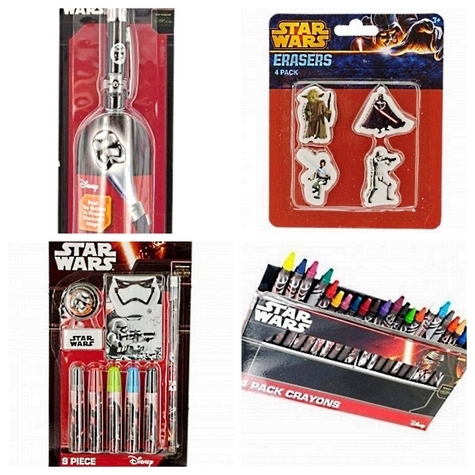 STAR WARS 4-Piece SCHOOL SUPPLIES AND FUN KIT! This outstanding 4-piece STAR WARS SCHOOL SUPPLY AND FUN KIT includes the STAR WARS Storm Trooper PROJECTOR PEN, STAR WARS ERASERS SET, STAR WARS STATIONARY SET, and the STAR WARS CRAYONS SET. All items are brand new in original packaging. Make writing and homework more fun with this STAR WARS Storm Trooper PROJECTOR PEN! This is a black twist pen with a built-in projector and a metal clip for easy attachment. Push the button to project the character image! This officially licensed STAR WARS Storm Trooper PROJECTOR PEN is brand new and has never been opened. This is an official product and not a bootleg, pirated, or copied item. Batteries are included (batteries are inaccessible and non-replaceable). Recommended for ages 3 and up. Comes packaged in a blister pack. This STAR WARS Storm Trooper PROJECTOR PEN typically retails for about $14.00! Blast away your mistakes with this 4-piece STAR WARS ERASERS SET featuring white erasers in the shapes of STAR WARS characters Yoda, Darth Vader, Luke Skywalker, and Storm Trooper with printed graphics. This officially licensed STAR WARS ERASER SET is brand new and has never been opened. This is an official product and not a bootleg, pirated, or copied item. Recommended for ages 3 and up. Comes packaged in a blister pack. WARNING - CHOKING HAZARD: small parts. Not for children under 3 years of age. This officially licensed STAR WARS STATIONARY SET is brand new and has never been opened. This is an official product and not a bootleg, pirated, or copied item. This awesome STAR WARS STATIONARY SET is a fun and useful school item! WARNING - CHOKING HAZARD: small parts. Not for children under 4 years of age. Great for drawing and coloring, this 24-Pack STAR WARS CRAYONS SET features colorful wax crayons with STAR WARS graphics on the wrappers. This awesome STAR WARS CRAYONS SET is a fun and useful school item! Better yet, it will make a fantastic gift! Recommended for ages 4 years and older. Comes packaged in a hanging box. I make every effort to ensure that listed items are fully and accurately described. All items come from a smoke-free environment. This fine STAR WARS 4-Piece SCHOOL SUPPLIES AND FUN KIT is located in Greenwood, IN and may be examined and purchased at this location. Contact seller for additional information or to arrange inspection and purchase. PAYMENT OPTIONS: PayPal, certified check, USPS Money Order, or personal check when shipped. Please allow at least 7 days for check to clear local bank. Cash only for local pickup. SHIPPING: Buyer pays $5 for delivery to any verified address within the contiguous continental United States. Ships via USPS First Class Package.